Harare — South Africa's Impala Platinum (Implats) says it will consider shutting down its Mimosa mine near Zvishavane if government goes ahead with plans to impose a 15 percent levy on raw platinum exports, which it says will make the mine unviable. The southern African nation proposed the levy 2013 in a bid to push platinum miners operating in the country to establish smelting and refining facilities locally. The tax was supposed to come into effect in January 2015 but was pushed to 2018 to allow the miners time to set up the facilities. Implats says Mimosa cannot meet the beneficiation requirement. 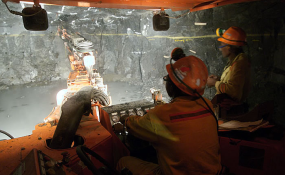 "It is crunch time as we would rather park the resource than post losses," Gerhard Potgeiter, group executive for growth projects at Implats told South African digital news outlet, miningmx.com. "This is a clear stance between ourselves and Sibanye-Stillwater," he said. IMplats and Sibanye-Stilwater each have a 50 percent share of Mimosa. Currently, all three platinum miners which operate in Zimbabwe - Anglo American Platinum (Amplats)'s Unki Mine, the Impala Platinum owned Zimplats and Mimosa Mine, send their matte for refining to South Africa. Implats chief executive Nico Muller said the company would give government time to make a decision. "There are certain realities that we need to face as businessmen. We either make money or not. If we are only making money to pay taxes, then that is not going to work. But we want to give them time to change decision on export levy." Copyright © 2017 The Source. All rights reserved. Distributed by AllAfrica Global Media (allAfrica.com). To contact the copyright holder directly for corrections — or for permission to republish or make other authorized use of this material, click here.